You can now develop film wherever you are thanks to this modern day film development kit. Since the 1800’s, photography has been a field of interest for many across the globe. It has enabled people to capture memories and moments in history which normally would’ve been forgotten. Although the activity has been fairly easy for people to pick up, the art of developing film has been limited to those with access to darkrooms and specialty equipment. While film photography isn’t as popular as it once was, a new startup is looking to make it more accessible with their solution to the issue of darkroom requirements. LAB-BOX is the world’s first multi-format, daylight-loading film development tank on the market today. 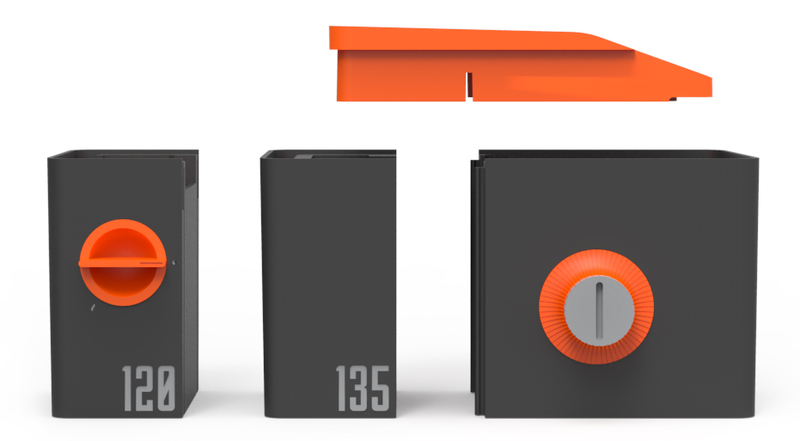 To use LAB-BOX, users insert their exposed roll of film (either 135 or 120) in the appropriate module. They wind it onto their reel, clip the film off of the cartridge, add the developing liquid, and the negatives are ready to roll. Once the film is loaded, users can use any development process they would like by pouring liquids in and out as needed. Once the liquid is added, it’s possible to agitate them as needed by rotating the outer knob. Continuous agitation is possible by filling the tank with 270ml of fluid. This only submerges the film partially meaning it has to be rotated continuously. Intermittent agitation, on the other hand, is possible by filling the tank with 500ml of liquid. This fully submerges the film, meaning the materials can be turned as needed. Monobath is one of the recommended chemical solutions that quickly and easily develops the film in a temperature range of 18oC – 24 oC (64 oF – 75 oF). The solution develops and fixes film at the same time. Caffenol is another agent that enables users to develop black and white films with coffee. It’s an eco-friendly developer which is easy to use.The 135 module is designed for 35mm rolls of film while the 120 module is for medium format films. The device is sized at 3.8” x 4.9” x 5” and weighs 1.5 lbs. It’s made of ABS stainless steel and has a tank capacity of 270 – 500ml. To date, the makers of LAB-BOX have raised over €480,000 via crowdfunding with an estimated shipping date of September 2017. Pricing for the device starts at €89. Each kit includes the following components: a cutting knife guide, lid, reel, cutting lever, film guide, outer knob, sealing screw, and a tank. Users also can choose to purchase either or both the 120 module and 135 module depending on their needs. it sounds like it is a good construction which is a good thing for a product that should last. I am going to ask some of my film photography friends what they think. This seems like a much easier process than the “old” way of doing film. Maybe it would afford people the chance to use film more often? Darkroom photography is something that I always wanted to learn. Maybe I would not use it that much, but I think that having that background would help me in photography as a whole. I have not used a darkroom in my life. I can also say that I do not have plans to do so because of the time it would take to get photos compared to the digital world. Maybe a novelty, but that is it in my opinion. There is a lot more crowdfunding options for photography then I ever thought there would be. I was just thinking about this the other day. Are that many people still using film? I am just not seeing that. I do not see it either. however, I am young and the photographers that I hang around are young as well. It will be interesting to see where the company goes from this point once the kickstarter is over.